Mission Statement - To help provide, through guidance and financial support, an environment for Carlsbad High School students to learn and improve their baseball skills with an emphasis on education and sportsmanship. The CHS Baseball Booster Club operates events and fundraising activities to support the CHS baseball team. The booster club, and its meetings, are open to all who would like to help support the CHS baseball program. Booster club meetings are generally held on the 2nd Tuesday of the month, time and location TBD. For additional information, see the booster club Facebook, Twitter and Instagram sites. 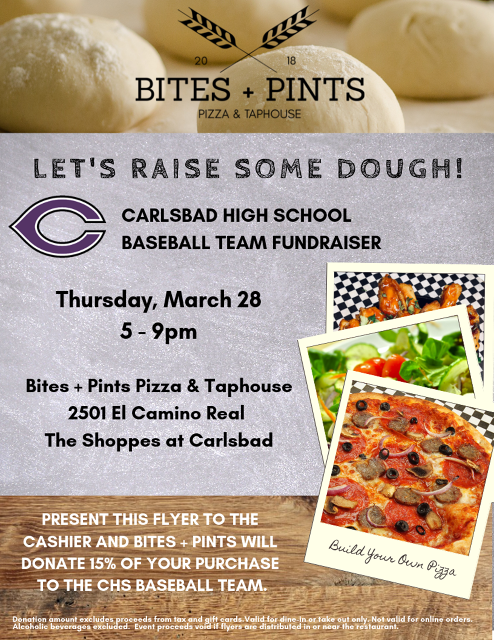 Remember, the Carlsbad baseball booster club directly benefits your son and all of Carlsbad Baseball! We use email for many of our communications, we need your email address(es). Please click here or on the Subscribe link to the bottom left. Alternatively, please send your email address to info@lancerbaseball.org. We want to be one of your chosen ones! This passive donation program allows registered members up to 3 beneficiaries and contributes between 1 and 5% of transactions to each program. Vons is the primary contributor in this program. Go to escrip.com - our group name is Carlsbad Lancer Baseball Boosters and our group # is 500006066. Have your Vons Club, Debit and Debit/Credit cards handy; it takes about 5 minutes to sign up. Thanks for doing your part to make a difference!